Comedies are something I’d be very interesting in doing. I always go with the story and character and if those are good and if the setting is something that’s scary (horror films seem to always take place at night and the weather’s always bad) then I might be interested. I have, I think to do a play a year is very good if you can afford the time and the energy because it’s difficult to do, it’s really the actors medium of course, because you’re really out there and nobody’s yelling cut so, yeah I have. Musical theatre is something I’m familiar with, I’ve been doing that. 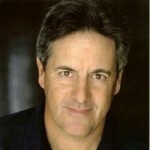 David Walsh Naughton was born in Hartford, Connecticut. He is an American actor and singer known for his starring roles in the 1981 horror film, An American Werewolf in London, and the 1980 Disney comedy, Midnight Madness. He attended the University of Pennsylvania and the London Academy of Music and Dramatic Arts. He also appeared in the television series My Sister Sam and also in episodes of MacGyver, Melrose Place, Murder, She Wrote, JAG and Seinfeld. He also starred in the short-lived sitcom Makin' It and sang its hit theme song "Makin' It".